Keypoint Intelligence - Buyers Lab (BLI) today announced the winners of its BLI PaceSetter awards in the MFP Platforms & App Ecosystems arena. 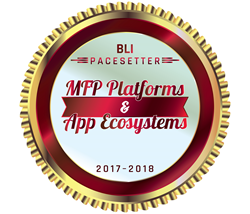 Keypoint Intelligence - Buyers Lab (BLI), the world’s leading independent evaluator of document imaging software, hardware, and services, today announced the winners of its BLI PaceSetter awards in the MFP Platforms & App Ecosystems arena. These awards recognise the document imaging OEMs that offer the most robust device-centric software platforms, along with the most impressive portfolios of associated apps, to help customers get the most from their equipment investment. To determine which OEMs lead the market in this area, analysts at Keypoint Intelligence conducted an in-depth evaluation of the platforms and apps of 11 document imaging OEMs. The study focused on dozens of points of differentiation divided into key strategic areas: Platform Technology, Developer Support, Market Approach, and App Portfolio. After gathering all the data, the Keypoint Intelligence team used a proprietary rating scale to calculate point totals in the areas studied. According to the Keypoint Intelligence data, Konica Minolta is one of the leading vendors for platform and app ecosystems due to its strong developer support, excellent platform design, strong portfolio of apps, and intelligent go-to-market strategy surrounding its platform and app ecosystem. As differentiating hardware becomes more difficult, Konica Minolta has capitalised on the ability of the platform to customise a machine to a customer’s unique needs. The award-winning bizhub Marketplace allows individuals to easily browse and implement apps at the MFP and is constantly expanding the portfolio of apps available. In this analysis, Xerox was one of the top scorers for each of the criteria categories: Platform Technology, Developer Support, Market Approach, and App Portfolio. Xerox has embraced the platform as an integral aspect of their hardware, and ConnectKey Technology is emphasised as a transformative problem-solver for every type of business. Apps exist for needs like usability, mobility, security, and customization. Xerox keeps pushing forward with developer support to ensure all the mechanisms are in place for successful apps. Xerox offers style sheets, remote machine access, developer forums and workshops, marketing materials, and more to optimise the network of developers which include ISVs, system integrators, dealers, and customers.